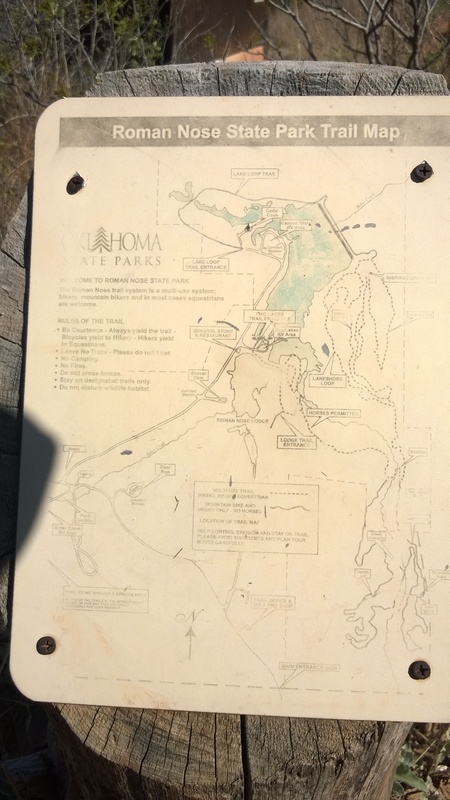 Hiking Roman Nose State Park | Rambling Outback. Sometimes along our journey the logical route between two predetermined points takes us through, well, what could perhaps be described as the middle of nowhere. I’m not certain that Watonga, OK is in fact the middle of nowhere – Oklahoma City is only a short 70 miles away. Ok, perhaps slightly to the right of nowhere. 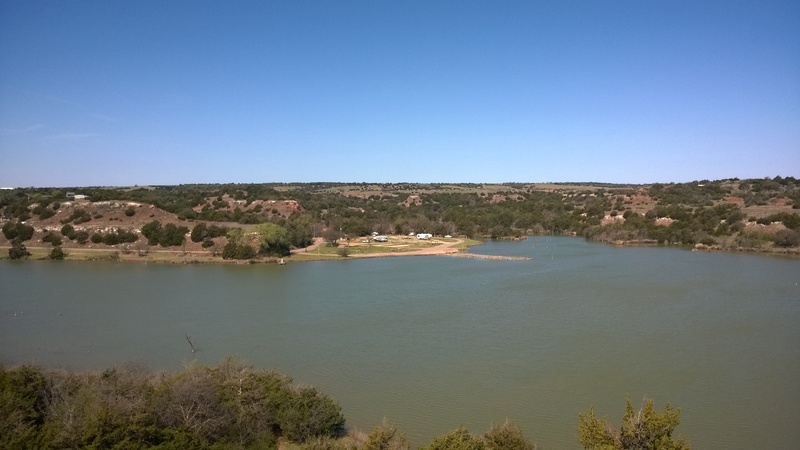 And to the North of slightly right of nowhere is the park we spent a couple of nights at: Roman Nose State Park. When confronted with a trail map such as this, sometimes it is difficult to develop a route. Hiking over the same ground over and over in order to hit all the major points isn’t fun. 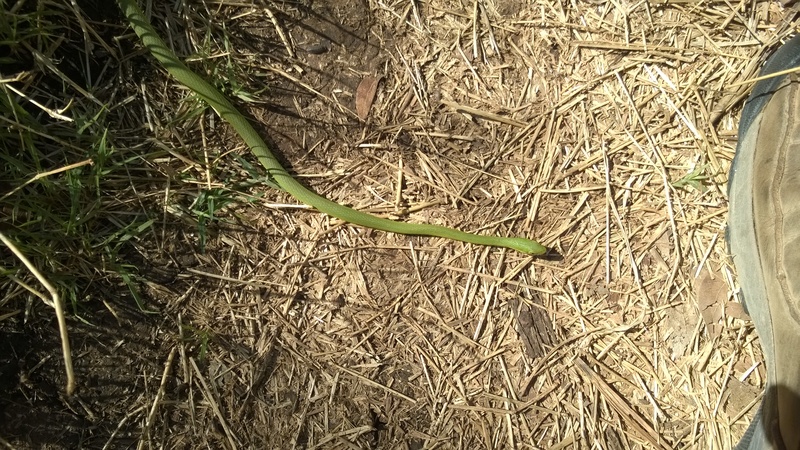 So, the trick is to find the most efficient way to cover the ground without backtracking. Not knowing precisely how long the trails were, we opted to do half of the trails at a time. Day 1 started out at the Lake Loop Trail Entrance, traveled to Inspiration Point, to the Mesa Loop, then the Lakeshore Loop, and the backtracking along Inspiration and Lake Loop. Total distance: 5.88 miles. Inspiration Point is well named, because although much of Oklahoma shares its topological flatness with Kansas, its neighbor to the north, this stretch of land was well..inspiring. 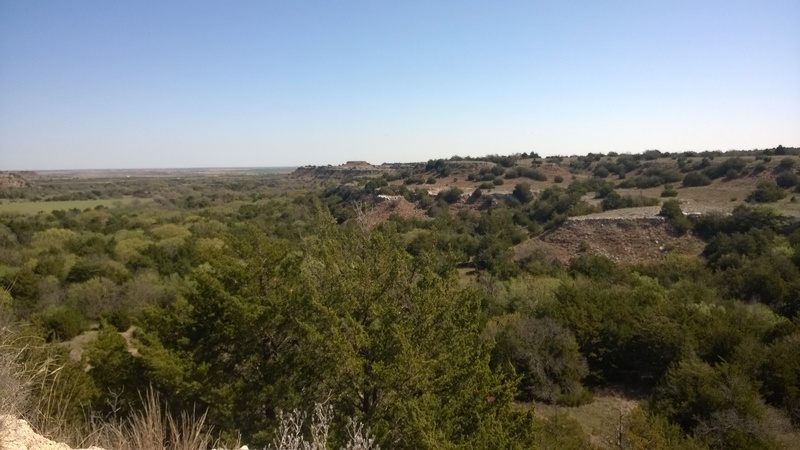 Canyons and vistas – both things I didn’t really expect to see in Oklahoma. The hills are chalk, or rather gypsum. The distinction between the two is somewhat unclear. Historically chalk was derived of natural chalk, but nowadays it is made out of gypsum. So, if its white and chalky, call it chalk. My dog has graciously provided his black pompom of a tail for scale. 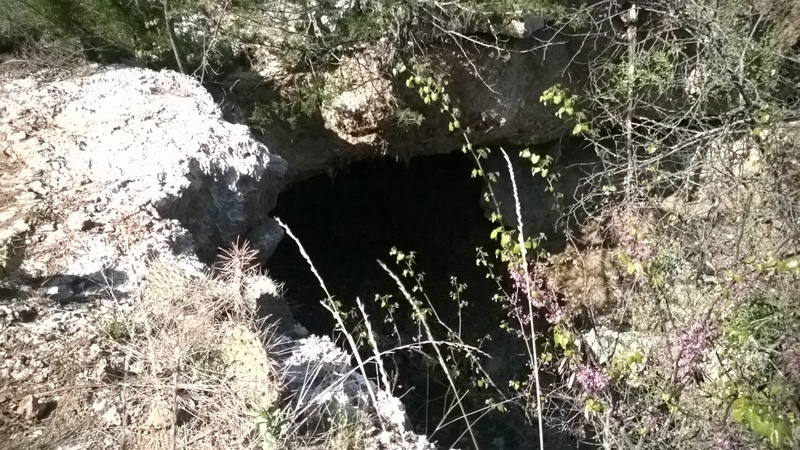 I couldn’t make this picture really come out as anything beyond “black abyss” but the cave was probably 15′ (~5m) wide and 20′ (more than 5m) high. 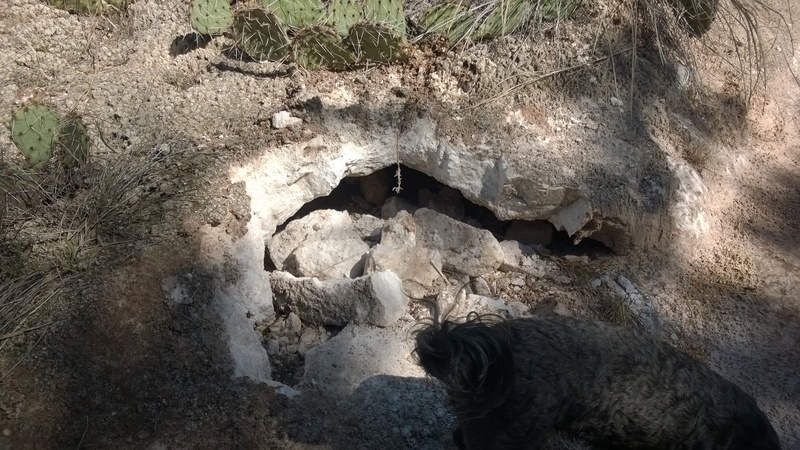 It was hard to tell how far it went and access to the canyon floor was more difficult than I felt like tackling…but it was deep enough to imagine more. 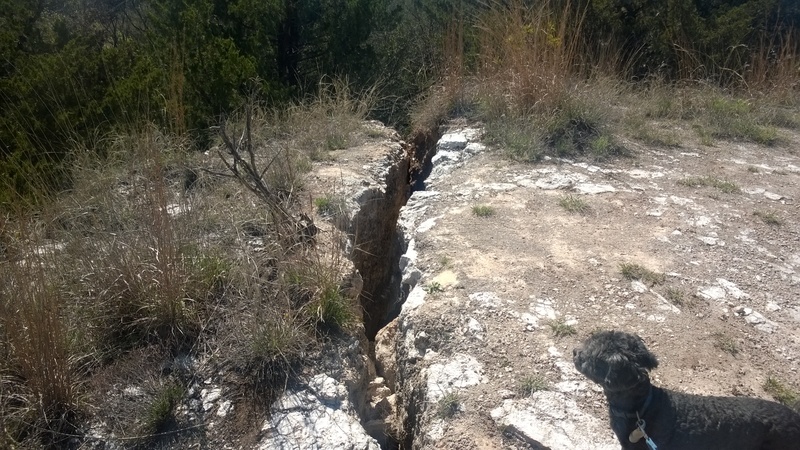 And others, not really caves so much as cracks….but fun to examine nevertheless. On Day 2 of hiking we took the Two Lakes Trail Entrance and did the ‘Switchbacks’ portion of the trail. Our mileage was just a hair under 5 (4.9) for the day. Oklahoma, not to be shown up by Colorado (Collared Lizard & Horned Lizard) put its own reptilian life on display. 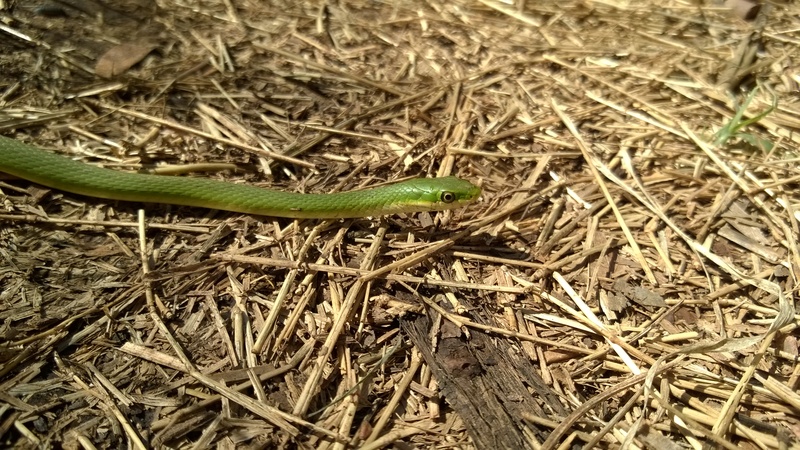 This fellow is probably a Northern Rough Greensnake, and he was quite cooperative when it came time to take his picture. He was just basking in the middle of the path and continued to do so after we departed. < Previous The Horned Lizard – The Coolest Thing to Shoot Blood out of its Eyes?